Mark Caulfield, founder and MD, The Caulfield Company took charge of a huge project to open up the back of this stunning house. He designed an ambitious glazed extension with the aim of allowing the garden and living spaces to flow together. Q: What were the stand-out priorities in your brief from the client, and how did you incorporate the kitchen into the plans? 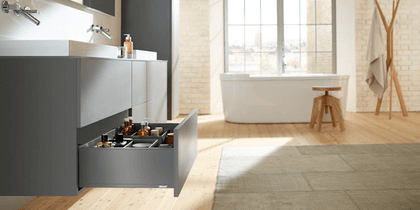 Q: Explain the reasons behind the choices of cabinetry and work surfaces – did you have to consider the exposure to sunlight, heat, UV and so on? The kitchen designer was Dominic Hurley of Second Nature kitchens. His choice of cabinetry was influenced by the clients’ love of simple, contemporary design so the Remo handleless design was the obvious choice to anchor the scheme. To accentuate the clean lines, he suggested white worktops and, mindful of the amount of glass in the space and exposure to sunlight, he specified Silestone quartz. To introduce contrast to the colour palette, the island is clad in graphite and similarly, to inject some warmth rich walnut timber is used as a focal point around the seating area of the island. Q: What were the most difficult aspects of this project? Visually and technically, the greatest challenge was to achieve a perfect fusion between the original house and the spectacular new glass building, particularly because it wraps around the whole corner in an L-shape. This can only be achieved because the glass structure is custom built and engineered to the highest possible degree to offer strength and millimetre perfect accuracy. Alongside these factors, the advanced roof and door technologies we use mean that this glass building also offers high thermal values, noise cancelling and automatic climate control. This means we are able to overcome all the traditional problems that have previously been inherent in living with such large areas of glass. The light and space afforded by the new building is truly spectacular and has transformed the house, in both in the way it looks and the way that it works. It’s light, bright and comfortable to be in whatever the weather outside. Perhaps this project’s greatest triumph is its total connection with the outdoors. It can be completely opened up whenever the weather allows, creating one single multi-purpose living space flowing through the house and the garden. The additional works, replacing the windows and doors across the whole rear elevation, have also been very successful in creating a coherent architectural finish. Q: What is your best advice for someone who may be planning a new kitchen and glazed extension? There are many different considerations. One is that glazing one or more walls of a kitchen extension removes them from the design equation in terms of where furniture, cabinetry and appliances can be positioned. The upside of replacing solid walls with glass is the additional light you gain and the potential to create seamless access to outdoors. It’s important to work with a kitchen designer who appreciates both factors. Climate control issues are particularly crucial in kitchens, where heat and steam are generated. Make sure your designer is familiar with the technical details of climate control. The two key factors in achieving a perfect climate with large areas of glass are insulating and shading. Double or treble glazing will insulate against cold whilst good shading will minimise glare and prevent uncomfortable heat build-up on hot days, ensuring the extension is comfortable all year-round.